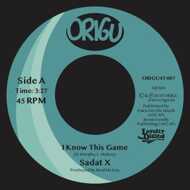 "I Know This Game" off Sadat's album "Never Left" is finaly out on vinyl. Produced by Local-Mu12 Member Real McKoy, this record is gritty and hits hard. The scratches provided by DJ Grouch fit the song perfectly, Point blank; Sadat X goes in on this one like the true veteran he is. One of a very select few to record with both Biggie & Jay-Z it is safe to say when you see the title "I Know This Game" you better believe him. The UMC's is composed of Haas G and Kool Kim, who released the critically acclaimed, full-length album Fruits of Nature in 1991, which garnered chart success with the duo's #1 Billboard Hot Rap Single "Blue Cheese" and #2 Hot Rap Single "One To Grow On." In 1994, the duo released its sophomore album, Unleashed but split up soon after.